Seventeen members showed up at Muir for the weekend with overspill in the Braemar YH and Braemar campsite. After a week of mild temperatures the winter climbers were praying for a frosty night. It was looking good at 8pm with minus 4 but it then clouded over. The bunkrooms however remained chilly and Anne was disappointed to have left her 'big boy' in Edinburgh. We were all relieved to discover that this was her 4 season sleeping bag! The weather forecast for saturday was pretty good with zero precipitation and light winds so an early start for Lochnagar was made by Alison, Kenny, Tim, Martin, Chris and Fiona M. On reaching the coire however it was not looking good with dripping ice and black buttresses. Plenty of faffing & indecision ensued and eventually routes were chosen. Tim & Martin headed up parallel gully A. Chris & Fiona M went up Raeburns Gully and Kenny & Alison up Black spout left. 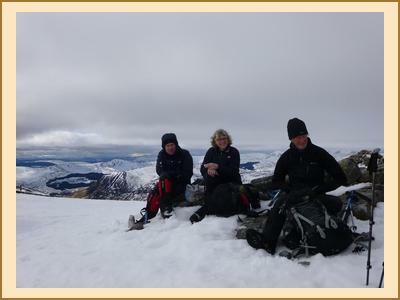 Alan, Anne & Harry who had enjoyed an extra hour in bed caught up the forward party and also headed up Black spout. 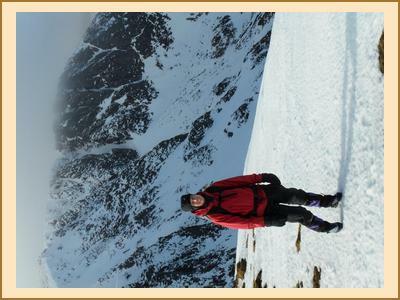 Fiona R and Mike had got into the coire even earlier and had Raeburns in the bag before lunch. Ben Macdui was the objective for Ian, Sharon, Shona, Alison F, Katrina, Clare A and Claire H. Paul headed up Cairn a Mhaim and Fiona C and Kate did Sgor Mor from Linn of Dee. Early evening back at the hut Chris and Fiona C did a sterling job of fire setting & wood chopping so soon the hut was nice & toasty. A convivial evening was had by all although Kenny was restless due to a misplaced walkie talkie. The early party on Sunday including Paul, Ian, Claire A and Katrina headed to Lochnagar for Black spout, whilst the remainder had a more leisurely start and more leisurely objectives which included some of the Glenshee munros and various corbetts. A great weekend in all, just a shame about the freezing level.